“Okay, where does that food come from?” Hernandez presses them. “A farm,” the students respond. “Do you know any farms?” he asks. Most of the students have never visited a farm before, let alone an organic one like Rick and Kristie Knoll’s. Their 18 wild, diverse, permaculture-inspired acres, complete with geese, chickens, and native wildlife, look like a lush oasis compared to the clean, monotonous rows of neighboring farms. “Raul, is that one of the farms where they make that thing, you know, with just one crop?” asks one student, looking at the property adjacent to Knoll Farms. “A monocrop?” Hernandez suggests. The student nods, then waves his hand in disapproval. 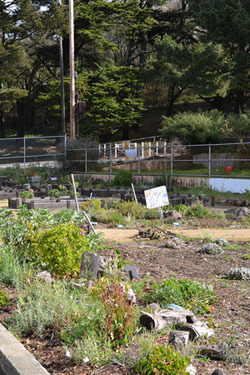 Hernandez’s students have been discussing industrial and local food systems in their food and garden elective course at June Jordan School for Equity in San Francisco’s Excelsior district. Started by Urban Sprouts, a nonprofit that supports underserved schools by providing garden and nutrition education, the school’s garden has tripled in size since it was built in 2005, boasting more than half an acre today. In addition to raised vegetable beds, it includes 30 young fruit trees, a 600-square-foot greenhouse, and a chicken coop, with a new beehive on the horizon. 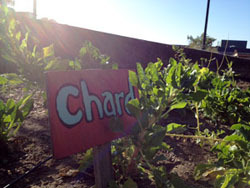 And as of this spring, June Jordan is the latest addition to the Schoolyard to Market program, a collaboration between CUESA and the San Francisco Green Schoolyard Alliance launched in January of 2011. Besides doing hands-on work in the garden, students are now schooled in running a successful business by taking field trips to farms and the farmers market and talking with farmers, market staff, and other experts. More than 100 students have participated in the program to date. The semester-long curriculum culminates in students selling their produce at the Saturday Ferry Plaza Farmers Market, with proceeds going back to the schools. Partnering with Schoolyard to Market has enabled Urban Sprouts to expand their presence at June Jordan to three days a week, and to bring on Hernandez to implement the curriculum. 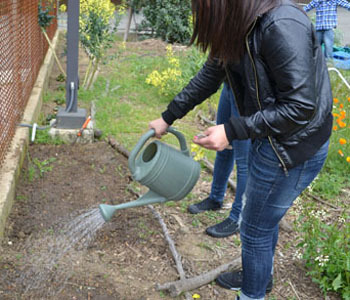 “Schoolyard to Market has allowed our staff to be out there more, utilizing the garden with students,” says program director Audrey Roderick, who teaches nutrition on Tuesdays. A small public school with high college admission rates and an emphasis on social justice, June Jordan serves about 250 students, more than 90 percent of them youth of color living in the Excelsior, Bayview–Hunters Point, and surrounding neighborhoods. Eight-five percent of the students qualify for free or reduced-price lunch, a high rate among San Francisco schools. After participating in the Urban Sprouts program as a student at Ida B. Wells High School, however, he planted a lemon tree in his front yard. His views about the value of farming and gardening had changed. 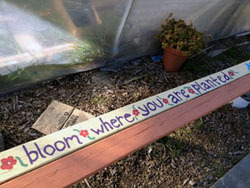 Inspired by his experience, he decided to work with youth and eventually landed a job as an educator at Urban Sprouts. Now that his family sees that he is tending the soil in order to give back to his community, they are supportive of his career path. Tomorrow, Schoolyard to Market students return to the Ferry Plaza Farmers Market, with Life Learning Academy selling plant starts on April 21 and 28, and June Jordan School of Equity and John O’Connell High School selling vegetables and herbs on May 12 and 19, respectively. All proceeds from sales go directly to the school gardens. You can also support the program by donating today. First two photos courtesy of Urban Sprouts.